My mom is the best! Whenever I go down for a trip she lets me refinish something, decorate something, or paint something… and it’s generally a piece of furniture! I usually suggest what we should change… she says, “Really?” Followed by and excited, “Ok!” We can’t tell dad beforehand because he’s nervous about change, but he almost always comes around and loves it when it’s done! Oh how I love that man! Mom’s patience with my furniture addiction has helped develop my love of decor, and I’m forever grateful for the thousands of lessons she’s taught me!! I fell in love with the moldings and solid construction. I think she found it at a thrift store! 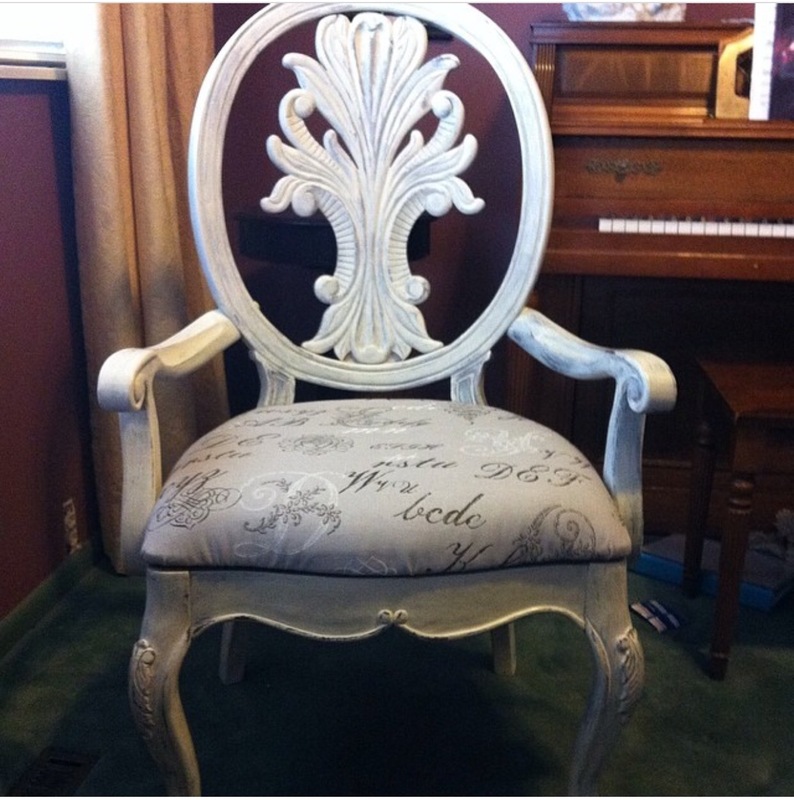 We used Old White Annie Sloan Chalk paint, and re-upholstered the cushion with fabric found at Hobby Lobby. 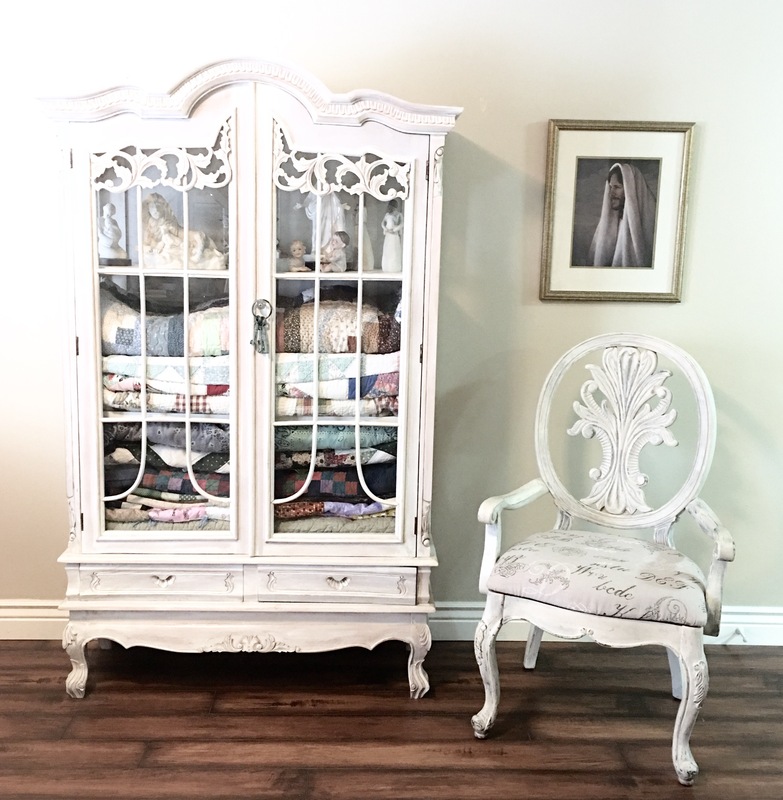 Side Note: I found another chair exactly like this at a yard sale a few months ago. The owner had painted it silver with a mauve cushion and it looked terrible! She wanted $120. I would love one for my own home, but just couldn’t justify that price on something I’d have to refinish… sigh! I’ll continue my search. Here it is staged next to another piece I love at mom’s house! She uses the hutch for vintage quilts. So fun! I’ve got to be the luckiest mom in the world! I have a daughter who shows me possibilities in life I never would have thought of on my own. Nearly every new thing I’ve tried has been because of her. Best of all, she inspires my decorating to heights I hadn’t dreamed of. 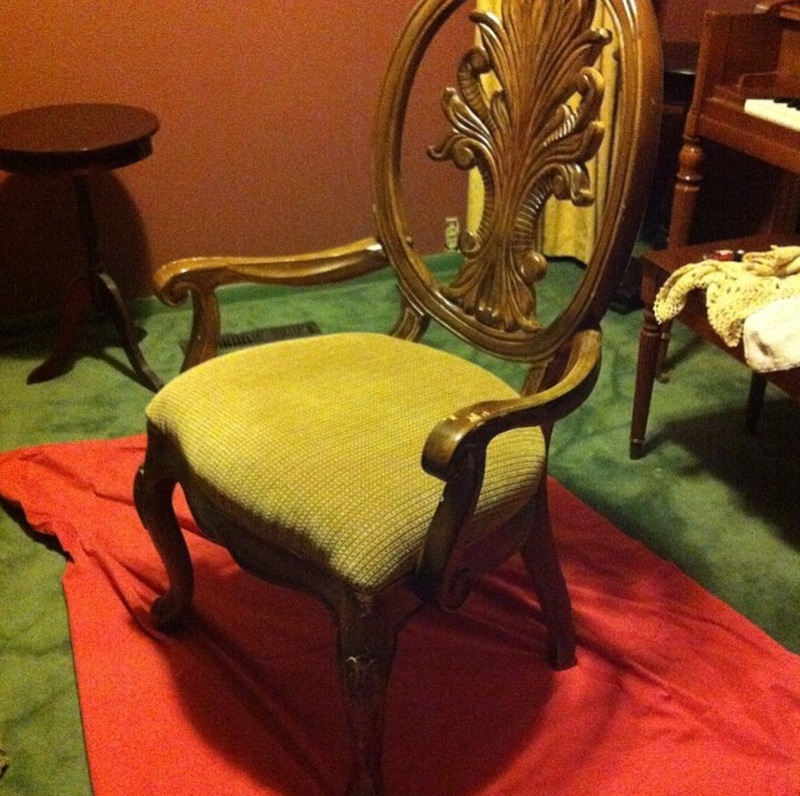 When I picked up this chair at a yard sale I didn’t invision how it turned out but I’m so glad for Jodi’s vision. I absolutely love the new look of my chair. It’s more than I ever dreamed it could be. Thank you Jodi girl. I love you! !